These records of the family of the noted Australian Scenic Artist are somewhat marred by the fact that there are only, to date, three English records of Harry, who arrived in Melbourne at the end of 1884 and died in Sydney in 1931. His first recorded presence in England begins on 3 April 1881 in Staffordshire when he was living at Walsall Foreign and shown as "Henry Waite age 22 years Artist PR born Burnly". The two other English records are as the father on birth certificates of two sons both named George, one in 1882 when he was named as John Harry and another in 1884 when his name was given as Harry. No details of his parents are given in English records. Most of the details about Harry's ancestry in England are based upon information in Australian records and these are detailed in "Harry in Australia." According to Harry's 1905 Marriage and 1931 Death Certificates, his father was George said to be an Engineer and mother Annie Garrow and it is George's family that has been traced back to around 1707 in Nottinghamshire. The relationships in this Whaite family have been fully documented, as is George's connection to the English landscape painter Henry Clarence Whaite, mentioned as Harry's mentor in an article in the Australian magazine "The Theatre", dated 1 December 1909. If Harry is George's son, Henry Clarence who is said to have been his uncle was actually his third cousin. The suggestion by another Whaite researcher that Harry Whaite may actually have been Samuel John born end of 1855 in Duckinfield has some credibility and is explored in "Just Who was Harry Whaite". This could always be contradicted by later research and just whether there was a real relationship between George and John Harry Whaite may never be known. 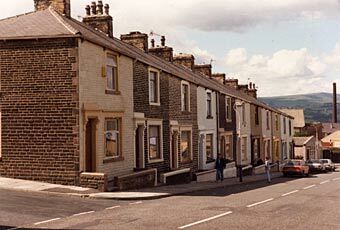 Coal Clough Lane, Burnley UK. ACKNOWLEDGMENTS:These records are based upon the patient research over many years mainly by Judith Moore of Flixton as well as Whaite family members Pamela Healy, Mavis Moore, Robert and Roger Whaite and others shown throughout the text. In the majority of these parts, the records finish at the end of Seventh Generation in order to lessen the chance of living persons being included, but details of later generations are available on request for family members.